Lake Norman Christian School welcomes applications from students who wish to study, and from teachers who love God, children, and excellence. We would love for you to tour our school! Read more. Lake Norman Christian School spent 6 wonderful years in the heart of Davidson; in the summer of 2018 we were blessed to find a new home on the campus of Christ Community Church in Huntersville on Old Statesville Road. 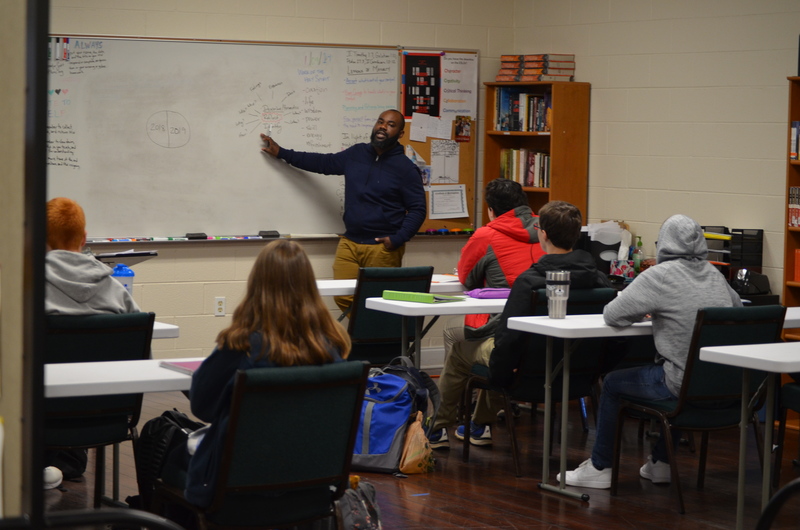 It is the ministry of Lake Norman Christian School to provide a college-preparatory education in a safe and nurturing environment grounded in the Christian faith. LKNC is a North Carolina tax exempt, non-profit 501(c)(3) registered corporation, and an independent, non-denominational school. It is a ministry of the Christian faith and operates for Christian education and ministry in serving the Lake Norman communities of North Carolina. LKNC was founded in 2008. Lake Norman Christian School admits students of any race, color, national and ethnic origin to all the rights, privileges, programs and activities generally accorded or made available to students at the school. It does not discriminate on the basis of race, color, national and ethnic origin in the administration of its educational policies, admissions policies, tuition assistance programs, athletic and other school administered programs. LKNC is located inside the Christ Community Church building in Huntersville, centrally located in the southeastern Lake Norman region. The school is within close driving distance of Cornelius, Davidson, Mooresville, Concord, and other neighboring communities. LKNC is accredited by the Association of Christian Schools International and the Southern Association of Colleges and Schools/AdvancEd. LKNC is committed to providing equal education and employment opportunity to qualified persons regardless of their economic or social status and does not discriminate in any of its policies, programs or activities on the basis of gender, age, race, marital or parental status, color or national or ethnic origin. Each year, our students serve the local communities. They volunteer for organizations such as Lydia’s Loft, Crisis Ministry, Davidson Town Hall, YMCA, Operation Christmas Child, and more. LKNC encourages students to lead and serve through student government, which includes middle and high school students. Our faculty is the heart of Lake Norman Christian School. These men and women pour themselves into the lives of their students and are committed to partnering with parents for the success of their students. Faculty must be certified by ACSI. Faculty uphold our Philosophy of Christian Education by maintaining a clear testimony of Christ's saving grace in their lives and by committing to Biblical integration in their educational disciplines.